Around the world, teachers work in conflict zones and urban slums, and in multigrade and multilingual classrooms that are often overcrowded. They experience the joy of seeing children learn and the frustration of trying to cope without the materials they need. They live the reality of 250 million children not learning the basics, whether they have been to school or not. 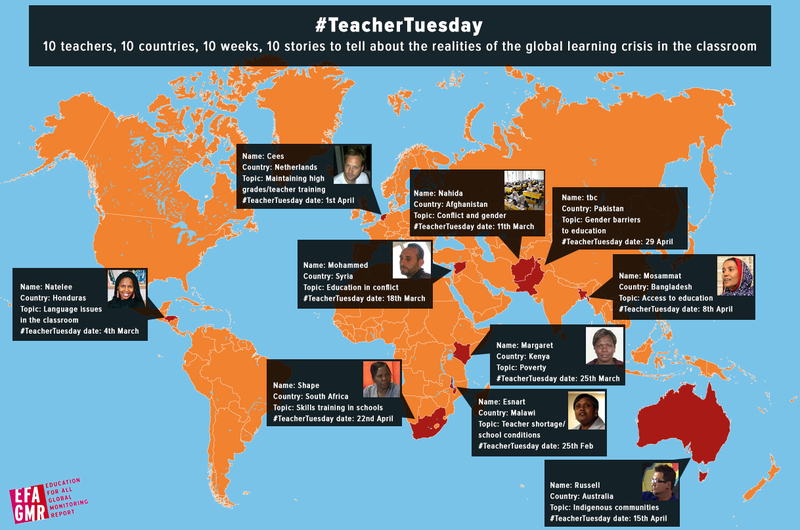 Over the next 10 Tuesdays, starting on February 25, 10 teachers from 10 countries will share their stories with a global blogging network as part of a new campaign, #TeacherTuesday. Teachers need more support to meet such daily challenges, as we showed in the 2013/4 EFA Global Monitoring Report, Teaching and learning: Achieving quality for all. But policies can only be effective if those responsible for implementing them are involved in shaping them. Policy-makers who aim to improve education quality rarely consult teachers or their unions, however. A survey in 10 countries showed that all teachers thought it was vital to have influence on the direction of policy, but only 23% felt they had any at all. To this effect, #TeacherTuesday is designed to give teachers a voice, and allow them to describe the difficulties of their everyday work. It is the start of an ongoing consultation the EFA Global Monitoring Report team will be carrying out with teachers, with the aim of publishing a teachers’ resource based on our latest Report later this year. Next Tuesday, our campaign begins with the story of Esnart, from Malawi. In her country, which is suffering from a huge teacher shortage, fewer than half of children are learning the basics. Our latest Report shows that globally there is a huge lack of qualified teachers, which hits disadvantaged children hardest. At current rates of recruitment, almost 60 countries will still not have enough primary school teachers in 2015. Join us next Tuesday, February 25, at midday GMT on twitter to hear Esnart talk about the reality of trying to teach over 200 students without a classroom, asking children to sit in the open sun and to write in the sand because they have no books. Ask her questions online as she takes over our account for an hour. To coincide with International Women’s Day, when we will launch the Gender Summary of the 2013/4 EFA Global Monitoring Report, Mariam Khalique, will write about the challenges of being a female teacher in Pakistan, where gender equality is far from being achieved and there are only 82 girls for every 100 boys in primary school. Mariam is the former teacher of Malala Yousafzai, the young education activist who was shot by the Taliban. For the third anniversary of the Syrian conflict, on March 16, we will hear from a teacher, Mohammed, who taught in Syria until the fighting got too much. Supported by UNICEF, he is now working as a teaching assistant in Zaatari refugee camp in Jordan, which hosts over 100,000 Syrian refugees. We are delighted to be able to announce that some of the world’s most influential teacher bloggers and networks are supporting our campaign, including Tom Whitby from the USA, Julie Lindsay from Australia, Jennifer James and the Mom Bloggers for Social Good network, Joe Bowers from Canada, Rosalia Arteaga, the former President of Ecuador, Emmanuel Davidenkoff from France, Zimbabwean blogger, @SirNige, regular education blogger at the Times of India, Meeta Sengupta, regular education blogger at South Africa’s Mail & Guardian, Athambile, TeachPitch and more. Given their reach, teacher unions are key partners for governments. This is why we are joining forces for #TeacherTuesday with Education International, the global federation of teachers and teacher unions, which represents over 30 million education personnel. To find out more about the teachers taking part in our campaign over the coming weeks, please visit our website. Take part in by writing your own blog, following #TeacherTuesday, sharing other blogs as they are written, and talking with the teachers every week on Twitter. This entry was posted in Africa, Asia, Basic education, Developing countries, Early childhood care and education, Equality, Equity, Gender, Language, Latin America, Learning, Millennium Development Goals, Out-of-school children, Post-2015 development framework, Post-secondary education, Poverty, Pre-primary education, Primary school, Quality of education, Teachers and tagged #TeacherTuesday Blog Series, education, Education for All, equality, equity, learning, post-2015, quality, target 4.c, teachers, teaching. Bookmark the permalink. Integration of technology for education and access to it might be a solution?